NOTES: An ancient Hawk kit that still works. For excellent historical background on this little fighter, I suggest you read Tom Cleaver’s review. - Me 163B-0 V-41 at Bad Zwischenahn in 1944. The last aircraft is the famous all red machine used on the first operational Komet mission, although it was hastily repainted before hand! As this is an old kit with very few parts, I had the aircraft assembled in 15 minutes, and I didn’t quite follow the instructions to get there, since I omitted to fit the landing ski on it mount at this time and painted the instruments on the panel instead of using the provided decal. Also, I inserted the seat without the pilot. Superdetailers will love building an interior for this kit, as it’s bare to stay polite. The next step was to putty and sand all the seams, the most troublesome being the joints around the part covering the slots on the wings. All the seams were subsequently primed and retouched. I hand painted the canopy frame Model Master RLM 66, then masked it and glued it on. Masking was also done on the little side windows and the kit was ready for the paint shop. The most difficult part was to choose which one to do. The red one was out of question, a friend having already done it. Then Tom Cleaver came along with his bird from 1./JG 400. That left two. 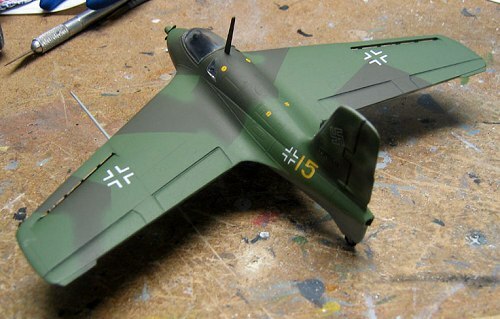 My choice finally went to the Komet from 7./JG 400, because of the nice mottling on the tail. 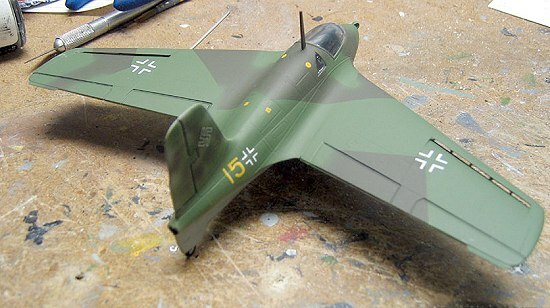 So, the aircraft was sprayed with Gunze RLM 76, then the wing’s underside were masked in preparation for the camouflage. I started with RLM 82 Dunkelgrun and only sprayed those areas that would have this colour, instead of the whole upper surfaces, thinking that I would save some paint in the process. Wrong I would be proved. I masked the green in preparation for the brown, and then proceeded with a coat of RLM 81 Braunviolett. Upon removal of the masks, I found out that I had masked the green areas too far from the paint and had bleak spots all over the place. I re-m ixed more RLM 81 and freehanded the repairs. On the plus side, it gives the model a field-repaired look. I did some touch-ups with the RLM 76 and I had already painted the mottling on the tail in the previous painting sessions. Although the instructions call for all-white wheels, I wanted them in the cool diamond pattern. Tamiya IJN Grey provided the primer for a coat of Tamiya Flat White, after which I masked the wheels with Tamiya masking tape and brush painted the black parts. I painted the dolly and the inside face of the wheels Model Master RLM 66. I hand painted the Pitot tube and the radio antenna with their respective colour and glued them to the model before proceeding with the decals. Poly Scale Flat Finish. Now, as Tom put it in his article, the Komets were rather glossy, and I suggest you do the same with yours to achieve a totally accurate look. I added the trolley, making sure it was straight and highlighted the control hinges with a pencil. This kit is another case of price versus quality. For a very small expense, you get a nice and easy to build kit with lots or marking options. Of course, the interior detailing is almost non-existent and the kit has raised panel lines. But don’t let that deter you from buying it. It makes for a fun project, and would be excellent to initiate someone to the world of modelling. For the true accuracy maniacs out there, I suggest the Dragon kit but for all the other people, grab it if you see it!